We have really been slacking on the blog over the last 4 months. So much has happened in our lives, not only adjusting to the RV life but my Dad passed away (Washington State), Adrianne’s Dad had a heart attack followed by surgery (Texas), traveling large distances, and the holidays. Needless to say, it’s been a little crazy around here and the blog wasn’t a top priority. 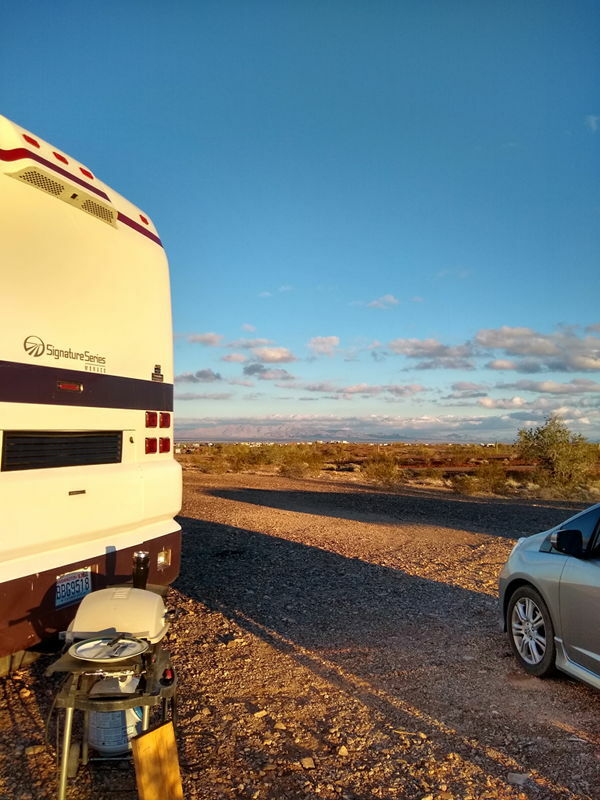 After spending the holidays with family in Phoenix, we headed out to the desert for some boondocking. We ended up near Bouse on Plomosa road, this was where the Women’s RTR was to be held a few days after our arrival. The area was beautiful, it had great trails to take walks on also. We heard about some people who had giant telescopes out in the desert who travel around giving free astronomy lessons. It was awesome! If anyone gets the chance to visit them, you definitely should. It was way better than we were expecting. Check them out at GEOASTRORV. We ended up leaving the WRTR for the main Rubber Tramp Rendezvous. 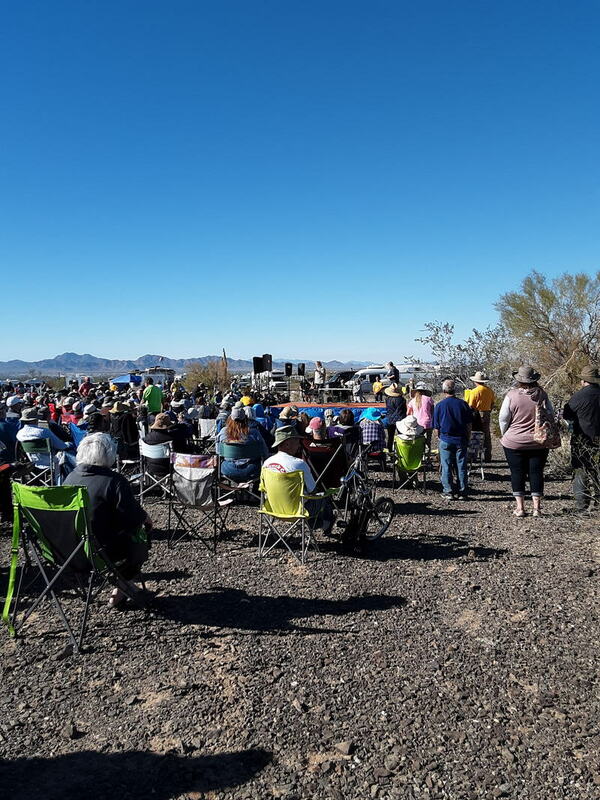 After a quick trip to the RV Pit Stop in Quartzsite to dump and fill with water, we headed to find a place out in Scaddan Wash. We found an excellent site, it was a 15 minute walk to the main stage at the RTR. This was a really unique event, it brought together all different kinds of people. RVers, van dwellers, rich, poor, young, and old. For me, the top two things at the RTR was a session led by Timber Hawkeye (author of the Buddhist Bootcamp) and the talent show held under the stars at night. One evening it started raining and didn’t quit until late the next day, who knew it rained this much in the desert. 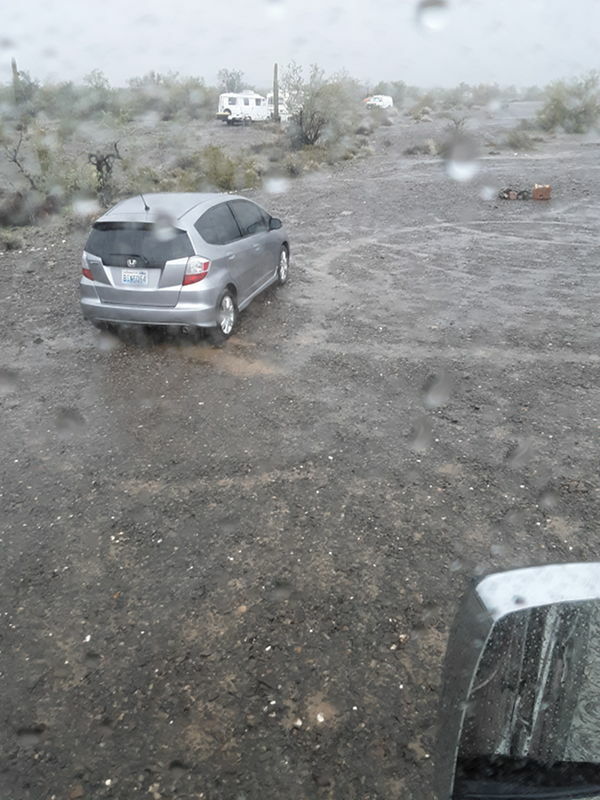 This is some crazy rain out here in the desert. 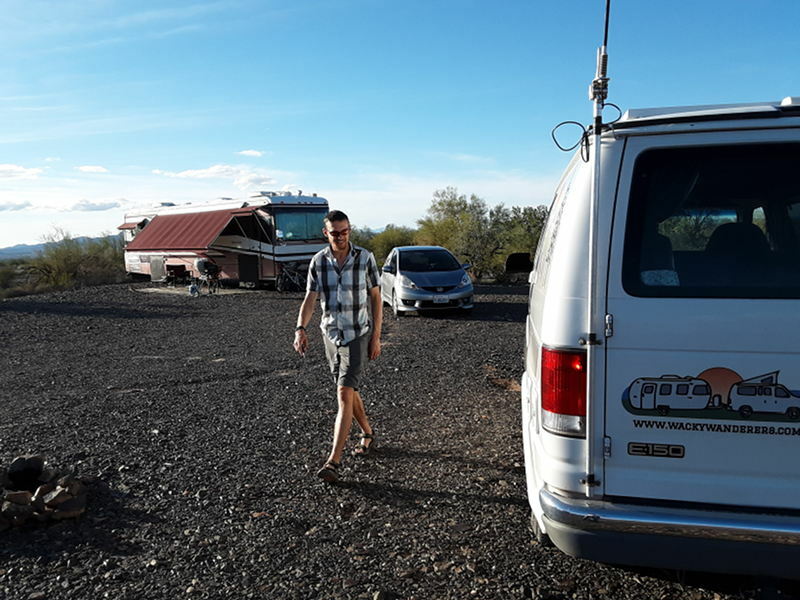 We had a visitor in Scaddan Wash, Justin from Wacky Wanderers. We met about a year ago and it was great to see him again. He travels full time with his family in their Airstream. They are awesome, feel free to check them out at wackywanderers.com. After the RTR, we headed to Plomosa Rd. 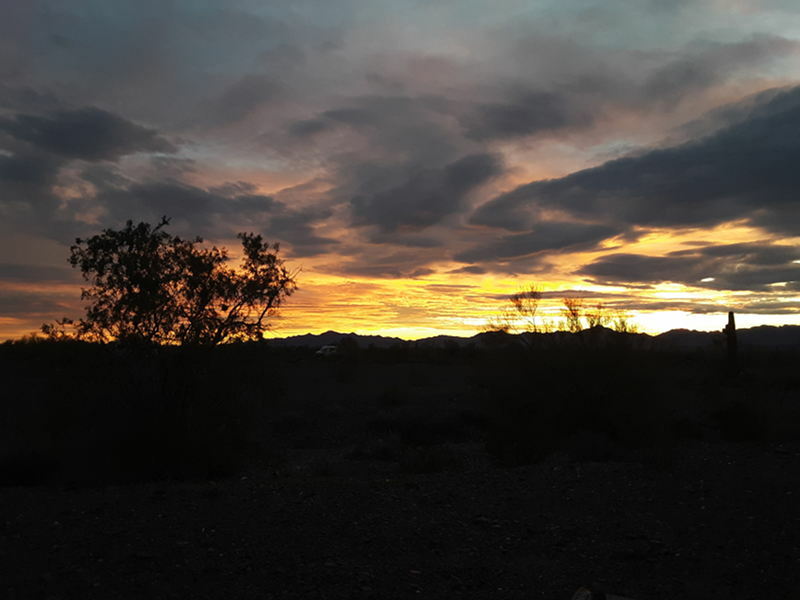 just North of Quartzsite. The big tent had just started and this place was packed. We found a nice area to park and put the jacks down. About 20 minutes later the music started, it was loud. We found out that we were parked next to a singles group. The music played for about 2 hours before we left to find a new location. Having been around a lot of people over the last few weeks, I wanted something a little more secluded. We ended up heading back to where the WRTR was held near Bouse. We knew this location was further out from town and had less people there. But, we also knew our unlimited AT&T data didn’t work there either. We stayed 2 days in this area while we got some cleaning, laundry, and other stuff accomplished. We wanted to head to Mexico for dental cleaning and exam. This led us to search for a spot south of Quartzsite. 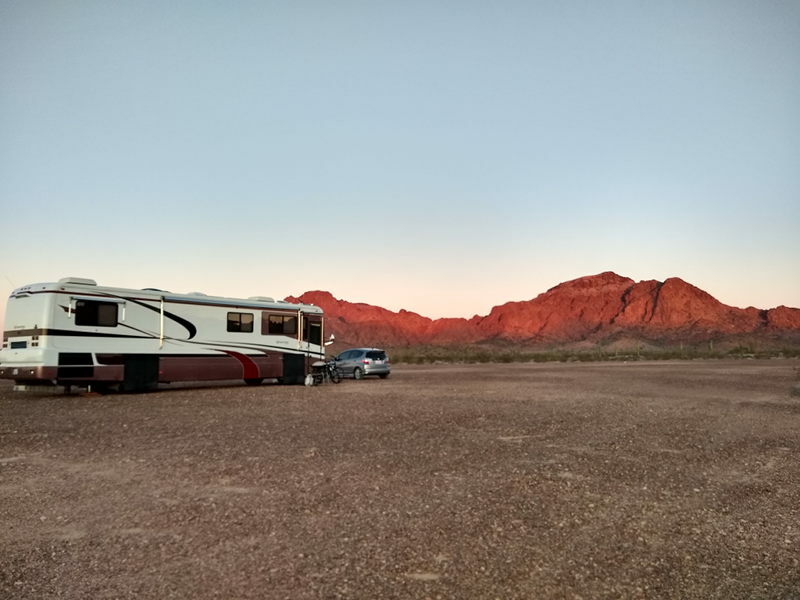 We found an amazing spot on King Road about 30 miles south of Quartzsite just off the 95. This place has an amazing view of the mountains, awesome AT&T, and plenty of space between RVs. The teeth cleaning went great in Mexico and for $30, it was well worth it. It was super easy to cross the border and get back into the US. We left at 8:30 am and were back by 1pm, we even did some grocery shopping in Yuma while we were there. I hear that the line really starts to get long after 11 am, that’s when they start to sell liquor down there and it’s very cheap and popular during the snowbird season. The Big Tent Show, I’m not sure what the big deal is with this show. 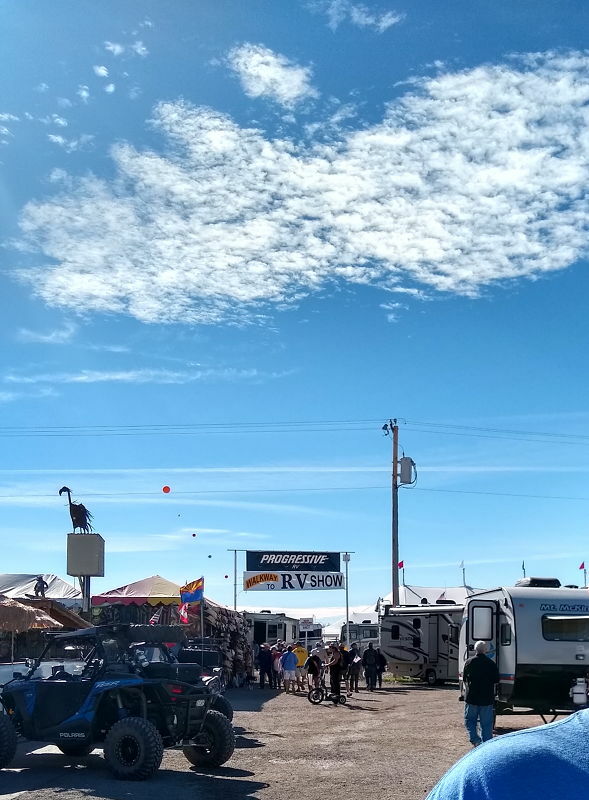 Sure, it’s an excellent place to look at all the different RV’s available or if you need some accessories for your RV. Maybe it’s just me, but I don’t get excited about shopping or looking at the newest cookware or gadget. There were many jobs available for Camp Hosting or Concessionaires for National Parks. We just weren’t looking for those things, if you are, this would be a great place to check out.